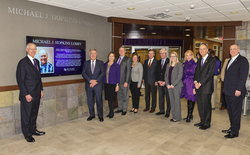 Regents at Stephen F. Austin State University unveiled the Michael J. Hopkins Lobby during their quarterly meeting Jan. 28. Pictured, left to right, are regents Tom Mason, Ken Schaefer, Brigettee Henderson (chair), Dr. Scott Coleman, Karen Gantt, David Alders, Bob Garrett, Kate Childress (student regent), Nelda Luce Blair (secretary), Dr. Steve Westbrook (interim university president) and Dr. Tim Bisping (dean of the Rusche College of Business). NACOGDOCHES, Texas - Stephen F. Austin State University's Rusche College of Business recently held a dedication ceremony to celebrate three new areas in the McGee Business Building. The Lou Ann Richardson Classroom, Walter E. Naymola Innovation Hub and Michael J. Hopkins Lobby are part of a multilevel renovation project created to provide a more corporate environment to help students "experience business." "We want students to learn exceptionally well, launch successful careers and become leaders in their fields," said Dr. Tim Bisping, dean of the Rusche College of Business. "It is rewarding to know that this project isn't just about what we hope to do. Rather, it is about us actually achieving our vision with the help of so many people." A collaborative classroom on the first floor of the building was named in honor of alumna Lou Ann Richardson, who is an executive vice president and head of relationship programs for wholesale relationship strategies and insights at Wells Fargo in Dallas. She has more than 34 years of industry experience. "It is important as alumni that we come back and assist students in becoming successful in any way we can," Richardson said. "It's a way to pay it forward. The focus on collaborative work that will take place in this classroom will help prepare students for their careers, regardless of what field they choose to pursue after graduation." Richardson graduated from SFA in 1983 with a Bachelor of Business Administration. She was a member of the 1979 Ladyjack tennis team and played intramural sports from 1979-83. She was a member and officer of Gamma Sigma Sigma, a resident assistant for Gibbs and Steen Halls from 1981-83, and the Ladyjack mascot during the 1982-83 basketball season. Richardson remains an active member of the SFA community through participation in the Rusche College of Business Executive Advisory Board, where she served as chair in the past. In 2014, the SFA Alumni Association named her a distinguished alumnus. "Lou Ann has been an incredible asset to the Rusche College of Business and continues to provide us with valuable insight and support," Bisping said. "We are so pleased to have a classroom in our building bearing her name." Two areas on the third floor make technology readily available for students while extending the corporate environment. The Walter E. Naymola Innovation Hub, named after Walter E. "Loddie" Naymola, offers technology-rich areas for student research and presentations. The hub includes a conference room where students can practice in a formal meeting setting. A One Button Studio also is available for students to create video projects. "I never dreamed I'd be able to do something like this for my school," Naymola said. "To see where SFA has gone in the past 40 years is incredible. To be able to reconnect and re-engage means so much to me. I pledge to stay involved and challenge all other alumni, if they are not already engaged, to get engaged to help our university grow." Naymola, who played basketball for the Lumberjacks and was a member of Phi Delta Theta, received his Bachelor of Business Administration in finance in 1978. He launched his career as an entrepreneur in 1984 and soon became a recognized leader in the specialty rental industry. During his career, Naymola has founded, acquired or scaled more than 100 businesses. In 2014, he established the Naymola Foundation, which primarily supports higher education, medical research and child advocacy programs. "One of the attributes that makes Loddie so successful is his ability to identify needs and build companies that meet those needs, and he utilized the same thought process in his donation to create the Naymola Innovation Hub," said Dr. Trey Turner, executive director of development. Likewise, the Michael J. Hopkins Lobby creates a real-world business environment that improves student focus and cognition, cultivates leadership qualities, enhances academic proficiency and prepares students for successful futures. Hopkins earned a Bachelor of Science in economics from SFA in 1970 and was a member of Phi Delta Theta. His career focus involves property management, leasing, construction, finance and retail development. Hopkins has served as an inaugural member of the Executive Advisory Board for the Rusche College of Business. "We want our students to experience business and their profession before they leave campus," Bisping said. "It's because of the generosity of donors like these that our students will learn in technology rich, collaborative and professional environments." Members of Stephen F. Austin State University's Board of Regents and university administrators stand with alumnus Walter E. "Loddie" Naymola during a dedication ceremony celebrating the Walter E. Naymola Innovation Hub. Pictured, left to right, are regents Tom Mason, Nelda Luce Blair (secretary), Dr. Scott Coleman, David Alders, Dr. Steve Westbrook (interim university president), Walter E. Naymola, Zane Naymola (Walter's son and SFA sophomore), Brigettee Henderson (chair), Dr. Tim Bisping (dean of the Rusche College of Business), Karen Gantt, Kate Childress (student regent), Ken Schaefer and Bob Garrett. 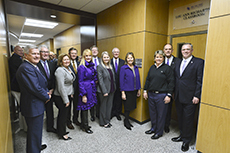 Members of Stephen F. Austin State University's Board of Regents recently celebrated the dedication of the Lou Ann Richardson Classroom. The classroom is located on the first floor of the McGee Business Building and encourages a collaborative work environment. Pictured, left to right, are SFA regents Ken Schaefer, Bob Garrett, Karen Gantt, David Alders, Nelda Luce Blair (secretary), Dr. Scott Coleman, Kate Childress (student regent), Tom Mason, Brigettee Henderson (chair); and alumna Lou Ann Richardson, Dr. Steve Westbrook (interim university president) and Dr. Tim Bisping (dean of the Rusche College of Business).